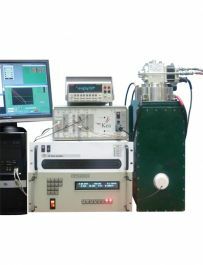 Magnets for NMR experiments are required to have a high homogeneity, which can be maintained over a wide range of field. Experiments are performed at fixed frequency and the spectrum is obtained by sweeping the magnetic field. This requires the field to be stable in spatial homogeneity and change steadily and repeatedly over time. 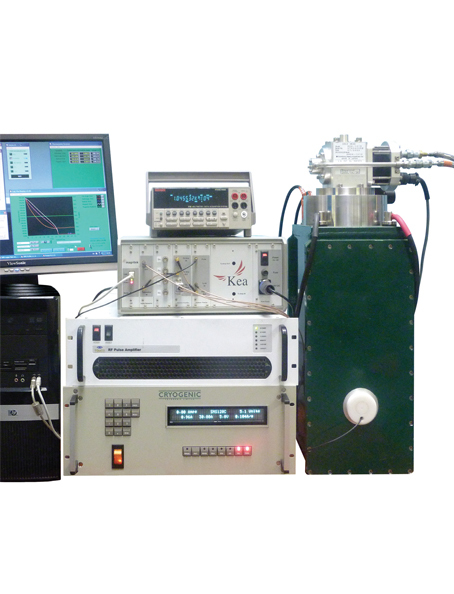 As the spectra can vary considerably in width it is essential to be able to control the magnet current and therefore the field accurately over a wide range of field with sufficient precision to see narrow resonances. In liquid helium filled systems it is common to operate the magnet in persistent mode and to perform magnetic field changes using a second sweep coil that can provide ± 0.1Tesla. This method is utilized to reduce liquid Helium consumption. With a cryocooled magnet it is not necessary to reduce helium consumption, as there is no liquid to evaporate. Instead it is merely required to have accurate and smooth ramping of the magnet current. With the power supplies provided by CRYOGENIC it is possible to set and measure the current accurately at the ppm level. The system is delivered as an integrated system with magnet power supply and computer with software. • High field system with a magnetic field of 14.5 Tesla, 89mm room temperature bore and 5 ppm homogeneity over a cylinder 20mm long by 20mm diameter. The magnet is cooled by a single Sumitomo cooler operating at about 4K and is surrounded by a radiation shield at 40K. The cryocooler is specified to operate correctly in the stray field of the magnet and provide in excess of 10,000 hours continuous operation . The outer vessel is welded aluminum and the magnet operates in vacuum but a thermal buffer is fitted to absorb high short term heat loads for instance during rapid sweeps of the coil. The magnet is made from NbTi and NbSn superconductors with truly superconducting joints to provide good persistent mode performance. A single magnet power supply is provided for the magnet. The ramp rates available are from approximately 10-8 to 10-3 per second of full value. A single current transducer is supplied to measure the current to 1ppm and output the result to the computer. With the Cryogen-free system there is no requirement to have a persistent mode switch and to use a separate sweep coil to modulate about a given field. One can simply modulate the main power supply and not use a switch. However, as an option we offer a sweep coil with active compensation giving +/- 0.1Tesla and a second, separate power supply. The mutual inductance of the sweep coil to the main coil will be designed to be a few (10) milliHenries.